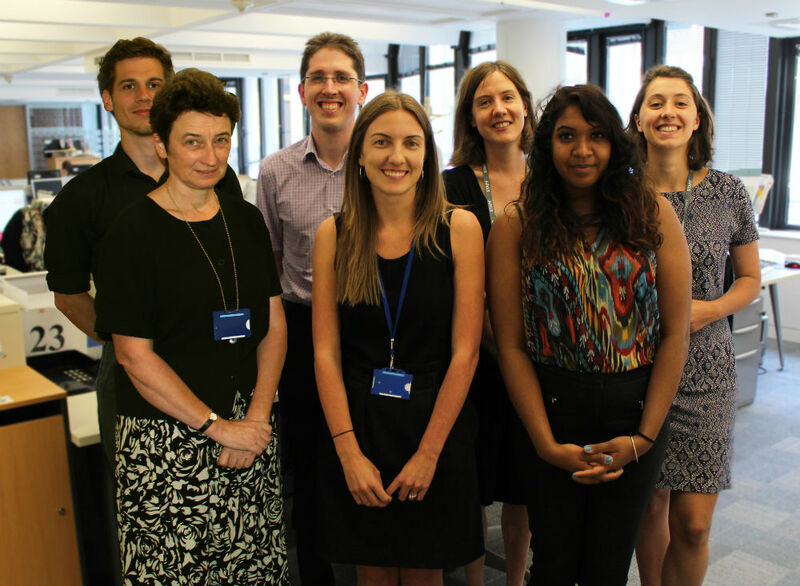 Several members of the Legislation and Policy Unit in the NHS Group recently went connecting at South London and Maudsley NHS Foundation Trust (SLAM). SLAM provides the widest range of NHS mental health services in the UK, has about 4800 staff, and serves a local population of 1.1 million people through over 230 services. Peter Howitt, the Unit’s Deputy Director, spent a full week at SLAM looking at the Behavioural and Development clinical academic group. Other members of the team spent two days out connecting, focusing on either addictions or psychosis. Throughout the week the team spent time in a variety of settings including: a day at HM Prison Wandsworth; sitting in on consultations; visiting services ranging from inpatient units to community support; and observing professionals from outside the borough identify issues and share learning as part of the Serious Incidents Panel. The visit to SLAM began with an introduction to mental health and mental health services. This was an eye-opening experience for several members of the team, and also brought to the fore a number of the issues mental health trusts and providers face in terms of funding and in managing the often complex needs of their service users. Jenny Harper saw how this played out in practice, and was impressed to see how the clinic coped with clients who tend to have chaotic lifestyles. For example, the team booked appointments for half their available time slots and kept the others free for service users who may just "turn up" as they require. Staff at SLAM were caring, polite and understanding, often going the extra mile to support service users. One such example was of a nurse supporting a service user facing eviction from his home. As well as supporting the service user to understand the situation, the nurse also liaised directly with the council on his behalf. Equally impressive was the response to threats and intimidatory behaviour from a particular service user who had lost his prescription from his GP surgery. Staff were understanding and sensitive, but remained resilient. On her visit to a low-secure psychosis ward, Helen McKenna found that, actually, many of the patients there were aware of their rights in the NHS Constitution, and particularly interested in how the use of control and restraint policies in mental health settings are consistent with their legal right to be treated with dignity and respect. Peter noted that it’s not often you go out and hear people praise a particular DH policy. However, several people spoke highly of the guidance on relational security called See, Think, Act finding it to be a practical handbook. The Legislation and Policy Unit work on a variety of projects, from Policy Improvement to Devolution. We each took away different lessons to apply to our work in DH. For Graeme Larkin, who is developing a Policy Certificate as part of the Department-wide Policy Improvement Plan, the key message was about patient experience. When sitting in on a consultation, Graeme explained who he was and why he was at SLAM. At the end of the consultation, the service user stopped to thank Graeme for being there and listening to his situation. Listening and engaging to patients will be a core element of the Policy Certificate training Graeme will be developing over the coming months. For Helen, a home visit to see a young woman experiencing severe psychosis emphasised the importance of working across Government to develop coherent policies that support people at their most vulnerable. The young woman’s mother had quit her job to spend time looking after her daughter as she needed full-time care. She had submitted a claim for carer’s allowance but was told it couldn’t be processed until her daughter’s claim for Personal Independence Payments had been confirmed. With a backlog of applications, the family have been waiting now for almost six months, and are finding it increasingly difficult to pay the rent. One of the most valuable insights for Peter was seeing how changes in funding flows can create perverse incentives within the system. For example, as medium secure services are now commissioned by NHS England, the local CCG were less concerned about reducing the numbers of patients using medium secure services, and also valued innovative approaches like the “ward in the community” a lot less. The experience emphasised how crucial it is to test policy changes with the front-line. The opportunity to share this connecting experience as a team was really valuable for our diverse unit. We have been able to reflect on our learning together, and compare insights and reactions to what we learnt and observed. Our unit has just expanded to include policy teams on Dentistry and Ophthalmology. We look forward to learning more about dental and eye care services through the Connecting Programme, and increasing our understanding not only of the experience of patients and staff, but also the policy areas of our colleagues.